I am a huge proponent of television on the Internet. I live on the Internet. I seldom turn on my TV. Sites such as Netflix, Hulu, and Amazon have satiated my appetite for serial entertainment. Having easy access to entire libraries of shows has resulted in too many weekends spent in front of the laptop, hazily clicking “play next” without giving much thought to other minor things I could be tending to, like making dinner or showering. Recently, Netflix analyzed over 20 popular television series to determine when viewers established their fandom, or the “point of no return” during their binges. An impressive 70% of audiences would complete a show’s first season upon hitting that sweet spot. For most shows, pilots aren’t indicative of its eventual success or failure. 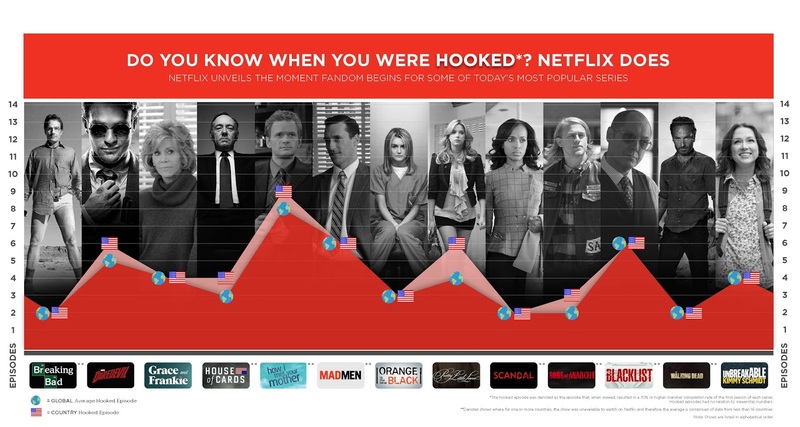 They sure as hell don’t get people hooked on a show, according to the Netflix data. Keeping that in mind, I do my best to give series at least three episodes before I decide to walk away. Whether that’s too wide or narrow of a window, that’s relative. I know someone who gives an episode one chance to make a good impression — his time is precious! Meanwhile, I like to give shows a chance to feel themselves out before I decide whether or not it’s worth the bandwidth. Orange is the New Black is (loosely) based on a true story. While I couldn’t power through Piper Kerman’s self-serving memoir, its moving pictures iteration has provided me with hours of over-the-top entertainment. 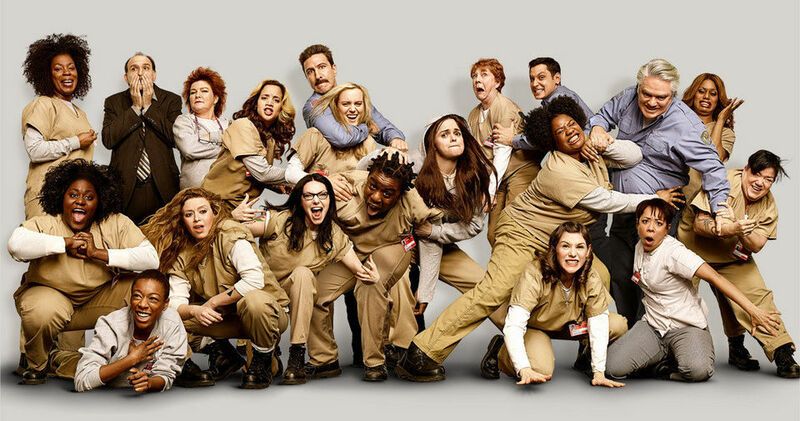 Per Netflix, viewers declared their love for the Ladies of Litchfield in three episodes. That rings true for me, as well. The series’ third episode, “Lesbian Access Denied,” mainly focuses on Crazy Eyes’ unrequited love for prison newbie Piper, aka, “Dandelion.” It includes this infamous scene, which introduced the concept of pie throwing as a symbol of undying devotion. The first two episodes of OITNB were interesting in their own right; the pilot set the scene for Piper’s entry to Litchfield while the following episode effectively taught audiences why you never piss off anyone who handles your food. However, it was episode three that made me, and apparently many others, want to see just how out of bounds the show could get. (Answer: Very.) I finished season one in a single weekend, and consumed the following two seasons in a similar fashion. This Netflix original animated series was largely panned by critics after its first six episodes. Audiences who persevered past that point were in for a real treat, as BoJack Horseman hit its stride in a big way. The season’s back six episodes included incredible depth in both story and character development, and resulted in a much more critically-acclaimed second season. When it comes to BoJack Horseman, I’m one of the very few who fell for it quite early into its run, despite its shades of Family Guy. According to Netflix, fans became hooked on the wonderful anthropomorphic world of BoJack at episode five, “Live Fast, Diane Nguyen,” which featured plenty of Boston accents and the best David Boreanaz-themed scam I’ve ever witnessed. (And I’ve seen at least three others.) Meanwhile, I became fond of the show at episode three, “Prickly Muffin,” which centered around BoJack’s youthful yet troubled co-star, Sarah Lynn, who is an analog for almost every Disney/Nickelodeon starlet who ever graced the screen. 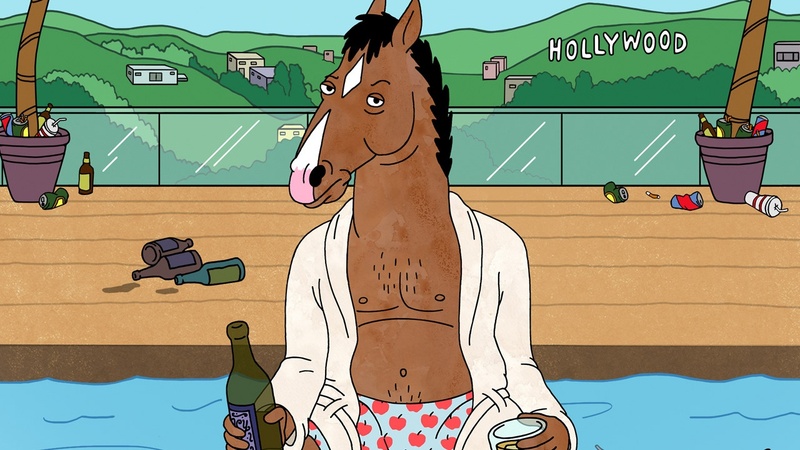 I completed both seasons of BoJack Horseman in approximately two weeks, and have since indulged in repeat viewings of some of my favorite episodes, including the one that got me hooked. Peep Show is an acquired taste. The comedy may not be well-suited for American audiences who are unfamiliar with British witticisms, and the constant point-of-view shifts between the show’s two anti-heroes may turn off general audiences. 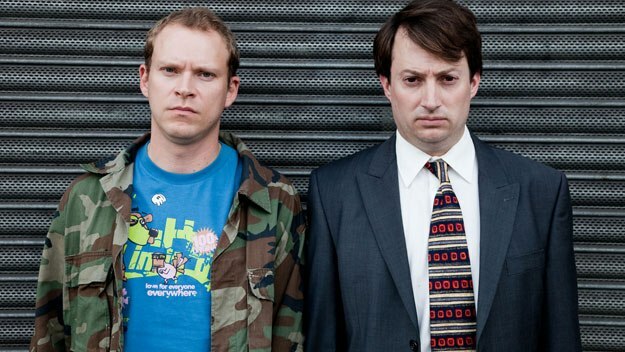 Despite those limitations, I still find Peep Show to be one of the most brilliant series ever created. Where’s the tipping point for Peep Show? Per Slate, it’s episode three, “On the Pull,” which follows the ultra-uptight Mark on an uncharacteristic wild night out with his more adventurous roommate Jeremy, Toni (Jeremy’s love interest…at the time), and a young goth girl Mark befriends at a party. While I liked the first season of Peep Show well enough, it took seven episodes — the season two premiere — to reserve my permanent spot on the Peep Show bandwagon. “Dance Class” introduces American neo-hippie, Nancy, whom Jeremy fancies. It’s not a mind-blowing installment, but for me, it successfully set the tone for a long string of noteworthy episodes. At eight seasons, the thought of watching Peep Show in its entirety sounds daunting, but every season is comprised of six half-hour episodes, so it’s not as challenging as it seems. I was able to breeze through every episode of Peep Show in a week, and I’m eagerly awaiting the ninth (and last) season. I can’t seem to find any solid data on a general tipping point for Silicon Valley. The show’s eighth episode and season one finale, “Optimal Tip-to-Tip Efficiency,” could serve as a solid fandom anchor thanks to this brilliant scene (arguably the series’ most memorable moment to date). For me, that was just icing on the cake, as I declared my love for Silicon Valley in episode six, “Third Party Insourcing,” thanks to TJ Miller’s performance in this outrageous take. 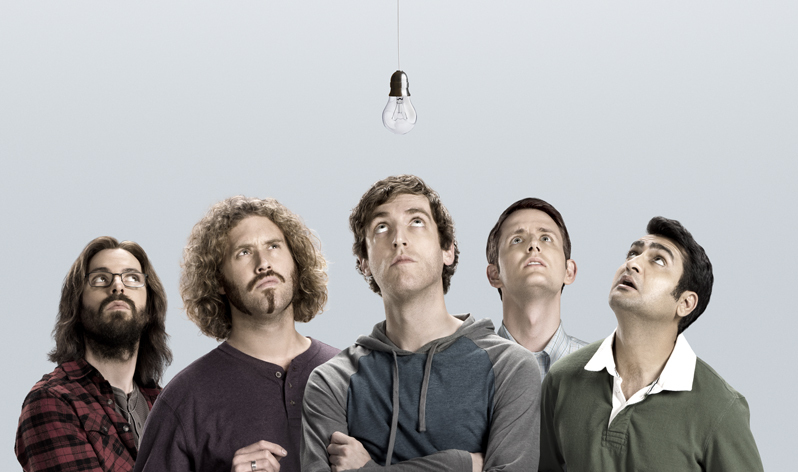 Silicon Valley is unusual in that I didn’t discover this show online. I binge-watched most of season one on a Transatlantic flight! Once I returned home, I caught the finale and impatiently waited about a year for the next round of episodes. I caught the second season as it aired on HBO, and have since treated myself to a couple of rewatches. This series is an oldie, but definitely a goodie. It’s not for everyone (grumble), and a lot of the material is dated. 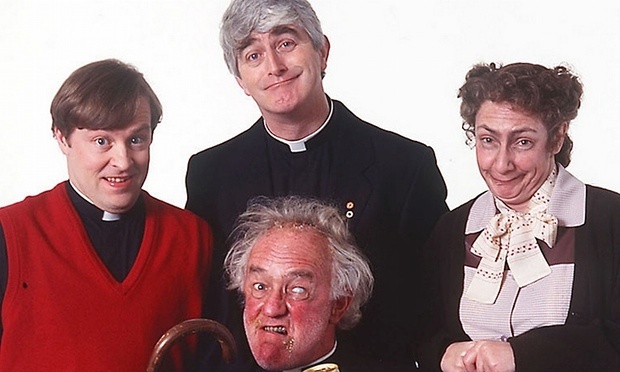 However, anyone who appreciates fine Irish humor and/or understands the trials and tribulations of growing up Catholic will certainly develop a fondness for the Craggy Island crew. Again, I can’t seem to find a definitive data point on when Father Ted fans were officially initiated. My point of no return? The season two premiere, “Hell,” which is chock-full of some noteworthy laughs (and Graham Norton as a priest on Speed, presumably). Season one — which is just six episodes deep and a solid introduction to the series and its characters — was a decent warmup for my eventual Ted marathons. As Father Ted isn’t readily available for free streaming here, I :ahem: found ways to satisfy my cravings and completed the entire run in about two weeks. I have since acquired the DVD boxset — it may be time to fire up the region-free player and go for round two! How awesome! Hope you enjoy.